The thick padded seat cushion furnishes comfortable yet durable support. A soft, micro-suede patch on the front of the cushion provides a buffer to rest the neck of the guitar when utilizing the stand section. The fully collapsible design with quick-release pin makes it easy to pack up and store. If storage space is minimal, simply remove the backrest for a completely compact solution. The contoured cradle is designed to hold your guitar securely while the finish-friendly, rubberized padding prevents scratching or scuffing. The padded ergonomic backrest secures to the seat bottom for added comfort and support during your set. 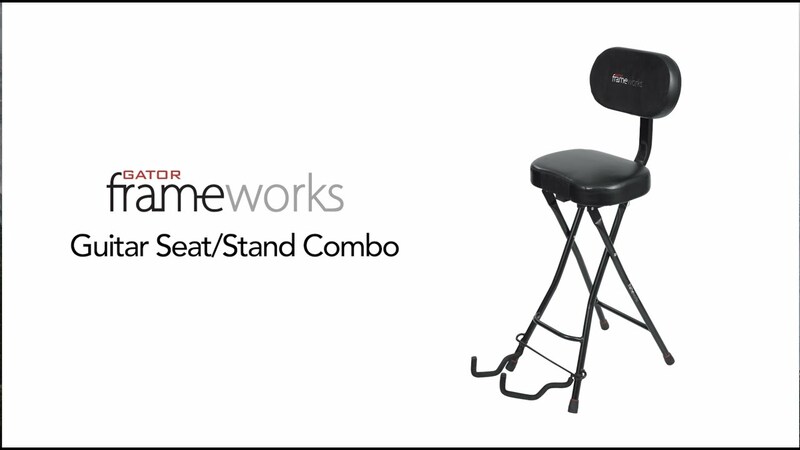 If you prefer a standard stool setup, or wish to full break-down the backrest is easily removed. When actively playing, and using the seat, the guitar stand on the bottom front legs neatly folds up and secures out of the way of your toe-tapping feet.